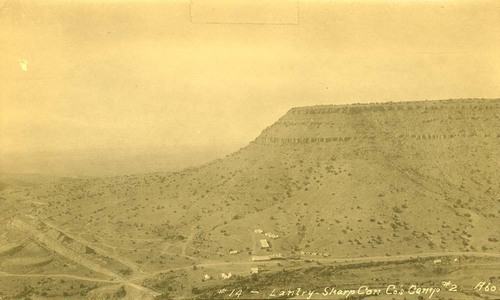 A birds-eye view taken from high on the opposite canyon rim at milepost 872.8 showing Lantry-Sharp Construction Company's camp in Abo Canyon, New Mexico. Construction of the AT&SF Railway bridges, tunnels, and tracks in Abo Canyon began in 1905 and the project was completed in 1908. The Lantry-Sharp Construction Company was a contractor on the project.